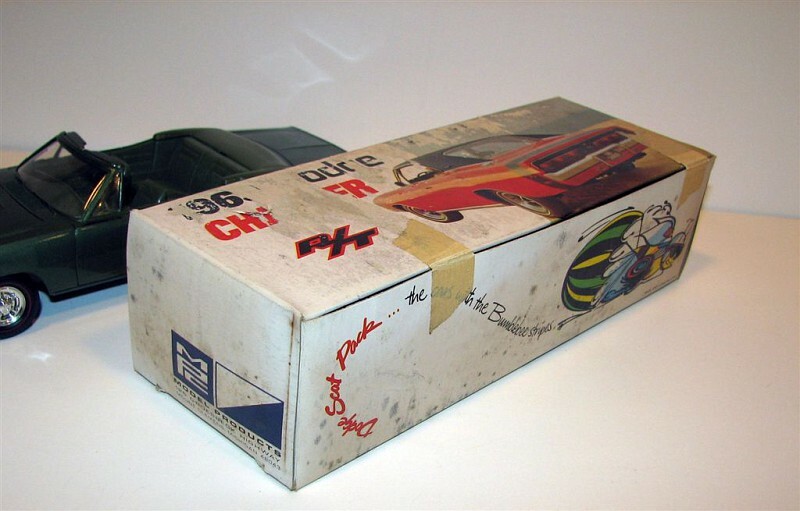 I track a lot of auctions both on eBay and some of the others specific to promo models. This weekend, on eBay, I was watching a ’69 Dodge Coronet 500 convertible with bidding in 4 figures, something I have not seen in a long time. While waiting for the auction to end, I started checking into the real deal as I get excited about rare cars. In 1949, Dodge introduced the Dodge Coronet, a full-size car. The Dodge Coronet was initially Dodge’s highest trim line car although from 1955, but then became the lowest trim line. During the 1960s, Dodge Coronet name was moved to Dodge’s mid-size entry. Dodge made eight generations of the Dodge Coronet which ran from 1949 to 1976. It was placed just above the Plymouth line in the Chrysler lineup. One of the rarest Dodge Coronet model is the 1966 Dodge Coronet 500 Hemis, and the 1969 Dodge Coronet 500 convertible of which less than 2,ooo were built. The 1966 Dodge Coronet 500 Hemis rarity can be attributed to the fact that there were only 136 units produced in 1966 and hence, the rarity. There were less than 2,000 of the ’69 built. Then I started poking around to see what one of these bad boys might set me back. Hey I love Chryslers too. Of course you can pick up some of them pretty cheap but they most likely will be basket cases. Remember, if these cars weren’t cared for, they became rust buckets. Recently a 1969 Dodge Coronet 500 convertible has been auctioned on eBay for $23,000. It was in nice shape but showed it’s age just a bit. During the summer, it could have been a daily driver. Well that’s not too bad. I could swing that. More searching and I found another on an auction site, sit down, or wait you probably are already. This one was going for $175,000. Ok, I’m out on that one. Now back to the promo model I was tracking. 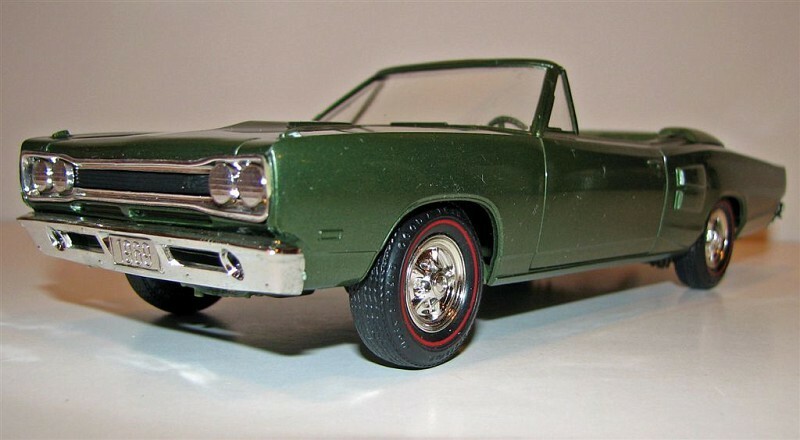 MPC 69 Dodge Coronet convertible, F5 Medium Green Metallic along with the original box. Like the real deal, was a rare one for a couple of reasons, low production numbers, the condition plus it came with the box. Convertible promo models first thing to break is usually the pillar holding up the windshield frame. Another item that can break is the rim around the steering wheel. As you can see from the pictures, this one looks like it just came out of the box. Sure the box isn’t that great which probably comes from a lot of in and out of storage or from times it was passed to the new owner. A promo model which comes with it’s box has about twice the value or one that does not. Ok now, ready to hear what the new owner paid for it? Take a seat. Oops, forgot you were sitting down. There were 25 bids and the winner took it home for $2,001.02! Think if you had one of these, or better yet me, and had paid the usual $2 for it? That would be one heck of an investment! No idea. What I would do is look for a Dodge collector club and they should be able to help. Check out the site AllMopar.com. Thanks for stopping by. Sorry for being so tardy on this response. I don’t give out my e-mail to people I don’t know well but there is an option for you because I’d like to share your story. You can upload images to a photo site such as Pinterest or Flickr. I you don’t have an account you will have to create one. They are free. Once you get them uploaded, shoot me the link with the story of you car and I’ll get it up on our site. Let me know if you have any questions. I look forward to seeing your pictures. I have one 69 dodge conv. 384,4 barrel,4 speed on floor, very rare. needs restoring.need a +price? Hey Don: Whatever you need Don we’d be glad to help you out. If you’re asking about a price I would go to Hemmings. That’s where I go to research many of my blog entries. If you’re trying to sell it, you’re welcome to post up here but I would also find a Mopar owner’s group that has classifieds. Good eye Jessy. That’s the danger of selling on eBay, you can get burned. I’d say this buyer has 3rd degree burns all over his body. Hi Don Your car sounds pretty cool I’d be interested in restoring it if you still have it. be able to restore it. Everything is original on it with matching #’s. Thank you. Wish I had the cash Don because I would be all over it. Have you tried a listing in one of the Dodge owners association groups? One of those guys would be hot on it. Good luck and if you don’t sell it by the spring, let’s do a story on it.